That evening I joined a group of young Muslim [Sunni and Alawite] and Christian friends in a bustling Damascene cafe in the Old City, where Sunni, Shia, Kurds, Christian, Alawite, from all parts of the country still mingle quite happily. Talking to people it is evident that no-one has escaped the horrors of war – whether it be close friends,loved ones killed and/or kidnapped, and/or homes and livelihoods destroyed. Yet, whilst realistic about the multiple complexities of the realities, all are determined to keep living, and most want to preserve the integrity of Syria, and reject the sectarian agendas that outside forces are creating. The western media is putting out that there are 70,000 fleeing the area. Turkey hasn’t opened the borders to people fleeing the ‘Russian bombing of civilians’. But where are the 70000? We are only seeing clips of hundreds, maybe a few thousand gathering. We cannot deny that there are still some civilians there and people who couldn’t manage to get to other safe cities, but remember, more than one and half million people have already come from Aleppo to Lattakia, Tartous and Damascus, to the safety of Government-controlled areas. So who is left in Aleppo? We know that there are a lot of foreign fighters there… it is all over the media… lots of Chechens in South Aleppo and Turkmen, and fighters from around the world. What the government and Russian army are doing is fighting Takfiris. Few civilians are left there, but we know there has been collateral damage. That is sad, but war is dirty and everyone is guilty. But the government is not targeting civilians. Those who fled to Latakkia and Tartous are Muslims. They don’t want to have the terrorists there. They are praying for the army to defeat the terrorists. If all the people the government are fighting are civilians, wouldn’t it be easy to take over the area? Why does it take five years? No. The army are trying to liberate the towns and villages in the Aleppo area. He went on to talk about Homs. There are parts of Homs that the rebels were in control of for a long time. They were taken out in a reconciliation agreement. My home and a lot of homes were destroyed because the terrorists occupied them, and were firing on the government-controlled areas from them. They were launching mortars and missiles all over the city that killed a lot of people. When we were told that the government would bomb our house, we told them ‘Fine. Go ahead.’ We want to defeat the terrorists, and if it means losing our home, so be it. Homs witnessed a lot of car explosions that killed a lot of people and destroyed a lot of houses. [Actual number of car bombs in one civilian area of the city is so far 33.] The city is now free of terrorists, but there are terrorists in the area, and the reconciliation project is still going on. We say to them: let the foreign fighters out, and lay down arms, and everything will come back to normal. In a lot of cities, the fighters are giving up their weapons, and some of them are joining the army against the takfiris. Homs is mostly at peace now, and there are plans already for its reconstruction. “We cannot deny the issue of political prisoners and we don’t like it,” he continued. A close member of my family spent nine months in prison for criticising the President, but he was released. They didn’t mistreat him or torture him. It is the same for most. You know the ‘Caesar Report’ is mostly a fake. It was financed by Qatar, and many of the pictures come from other parts of the region, or are even of Syria soldiers. It is ironic that Qatar, where there are no human rights, should fund a report that claims to be about human rights! In any case, the President issued a decree in 2014 lifting the emergency laws that say that the President cannot be criticised. The problem is that the Secret Services continue to arrest people for doing so, even though the President has called for the cessation of such action. Actually, contrary to the mythology presented in the West that Syrian people live in fear and will not say a negative word about the regime, I found very few people who were not openly critical of the regime. The issue that was mentioned to me again and again, both by supporters of the regime, and of opponents, was the corruption within the regime, and the presence of ‘bad characters’ who wield excessive influence. By contrast, talking to Sunni, Shia, Druze, Kurds, Christians, residents of Syria, refugees in neighbouring countries, internally displaced people, supporters or opposition, I have heard very little criticism of Assad himself. The fact of the matter is that, whether the West likes it or not, Assad personally retains an enormous level of popularity and respect. There seem to be very few people, even amongst those who are highly critical of the regime, who believe that the secularism and pluralism of Syria can survive without him. Even refugees outside Syria, who have opposed the Syrian Government, have expressed to me their deep fear, of what would happen if Assad were deposed and the US NATO backed “moderate rebel” forces gained power. The following day I met and had lunch with another young Christian friend who spoke freely about the struggles of life amidst the conflict. She too was from the Old City of Homs and had fled the rebel occupation of the city. She echoed the narrative of others I met in Homs itself. Together we visited a medieval caravanserai which I last visited with my family in 2010. A place of craft shops and culture, I had assumed that it would be boarded up, but no the shops were still open. I watched one man making replica swords and medieval armoury; another making replica clay tablets of Ugarit writing and Koranic verses, artists selling paintings, and other shops of silks and carpets. How they survive I don’t know. “None of us have the money to buy luxury items” she said. This is all we can do – to keep working and to keep living until peace comes. In my view, these people, and the many friends I meet, represent the hope for Syria. These are the people who will ensure the survival and healing of Syria… if the international community don’t sell it to the forces of violence and terror. That evening I had dinner at a friend’s home, in the company of a teacher, a doctor, a university professor, a TV presenter, and another university teacher and independent translator. They were people from different faiths and communities and different parts of the country. We shared in wide-ranging, deeply honest and open discussions on social and political realities of life in the country, the conflict, it’s implications, and the tragic effect it is having on everyone and everything. I have huge respect for these friends, who in the face of so many difficulties are committed to and desirous of a brighter future for all the people of the country. Despite the conflict, the University of Damascus continues to operate, with a shortage of staff, and with students who still come from all over the country to complete their studies. Everyone has their stories of suffering, loved ones killed, homes and livelihoods destroyed. It is one of the largest universities in the Middle East. Given the abundance of highly intelligent students, different political views are represented amongst both students and staff. But the University has suffered as well. Several times it has received direct hits from rebel shells. Staff and students have been killed. I met one professor who had both legs amputated following a car bomb explosion. Within the University, there is a strong desire to set up a department for the study of Peace and Reconciliation and Conflict Resolution, and the University is seeking to work with the Centre for Peace and Religions at Winchester University to develop a joint programme. This area of study and research will be vital for the long process of healing that will be needed once the conflict has ended. I met with the President of the University, Dr. Hassan Kurdi and also with Professor Dr. Mohammed Tawfiq Ramadan, Dean of the Faculty of Islamic Jurisprudence, and son of the renowned former Grand Mufti, Dr. Moahmmed Said Ramadan Al-Buti, who was assassinated in his mosque in 2013. A scholar who supported inter-religious dialogue and the plurality of Syria, his son is continuing his father’s work. Coming to Syria independently, my primary purpose, and one which was largely successful, was to spend time with and speak with ordinary Syrians, and it was a joy and privilege to speak with many from different backgrounds and different parts of Syria. Though I was not able to go beyond Damascus on this occasion, I talked with many who have experienced the horrors of Homs, Aleppo, Daraa, Deir Ezzor etc. I was deeply disappointed that my efforts, with the help of friends and contacts, to visit Aleppo, failed. As I was travelling independently, the paperwork and permissions required to visit the city, and the number of departments and officials through which such application has to proceed, was just not possible in the time available. It was quite telling that even the Grand Mufti, who told me when I met him, that he would gladly support me in visiting Aleppo, felt he would be unable to influence the speed of the bureaucratic procedure. Civilians and supplies are now travelling freely and safely between Damascus and Aleppo since the Syrian Arab Army has cleared the highway of the Western & Gulf backed extremists, however, the government-controlled half of Aleppo is still a dangerous place due to the raining shells, bombs and sniper -fire of the “moderate rebels”. I was willing to put my life on the line to visit friends and contacts, including members of the Christian community there, because no-one from the West is reporting from and about those areas. And our desk-bound experts in London, Washington and around the world, refuse to listen to the numerous different voices and realities on the ground. In my view, by refusing to do so, they are only helping to perpetuate the conflict and the suffering of the innocents on all sides of the conflict. The tragedy for so many millions is unimaginable, and no party to the conflict is free of blame. Reverend Andrew Ashdown is an Anglican priest in England. 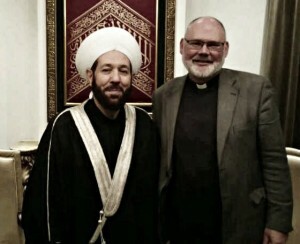 He has been visiting and leading groups to the Middle East for over 25 years, and has visited Syria four times since April 2014, both as a member of faith delegations, and more recently independently. Andrew is undertaking research into Christian/Muslim relations in the region.